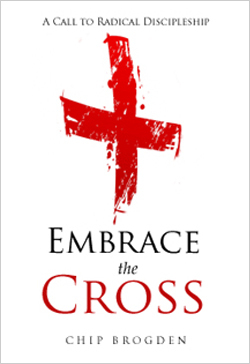 Embrace the Cross was written specifically to call people to radical faith in Jesus and Christ-centered discipleship. This book contains nearly everything Chip has ever written about the Cross, discipleship, and following Jesus – plus some things never before published. Every chapter compels the reader to consider what being a real disciple of Jesus is all about. The goal of this book is to challenge, confront, convict, and convince both saints and sinners alike to embrace the Cross! But what is at stake here is more than just a book. The book is simply a key that opens the door to a much larger world. In the back of the book is an invitation to visit a special website and enroll in our basic discipleship course. When you give this book to your friends, family, neighbors, or strangers that you meet, you won’t just be giving them something else to read – you’ll be giving them an opportunity to know Jesus in a deeper way. Because the book leads them to the discipleship course, and that leads them to spiritual maturity in Christ. Of course, all of it points to Him anyway.